A situation we come across now and then is the through-and-through intra-oral laceration. These can be tricky to repair. The typical mechanism for this injury is a tooth piercing the intra-oral mucosa. 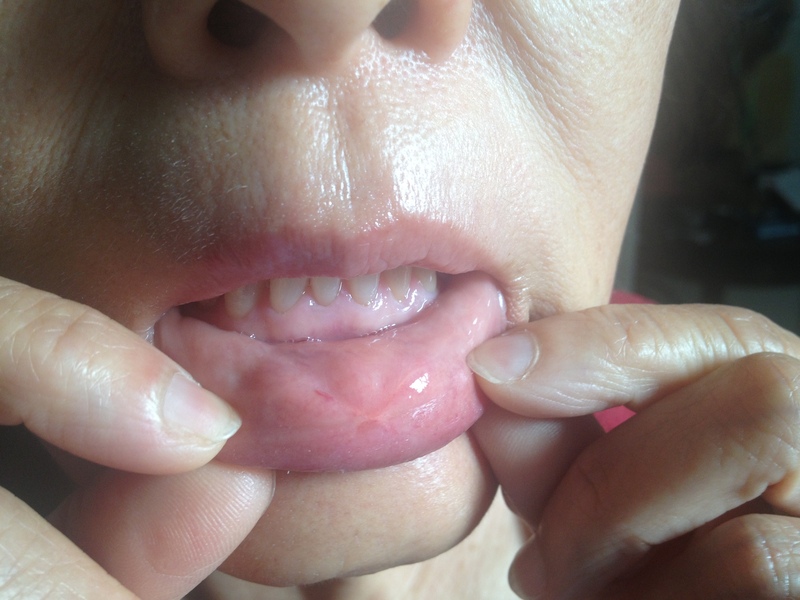 Thus, many of these injuries occur around the lips and mouth. This woman fainted and hit her face pretty hard on the ground. It resulted in a through-and-through intra-oral laceration. 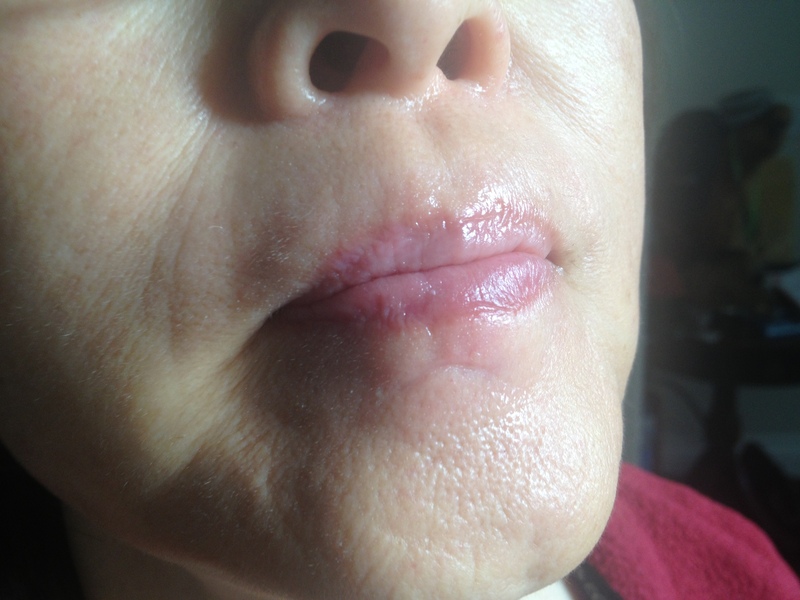 In this post, I’ll review the specific repair technique used for this patient and the concept of the layered closure. This laceration doesn’t look like much on first glance. The laceration didn’t look like much at first glance, but on closer inspection, it’s actually through-and-through the intra-oral mucosa to the epidermis! To repair this wound, the first step is getting adequate anethesia in a very sensitive area. Local injection into the wound has a tendency to cause localized edema and distort the tissue, which makes alignment a bit trickier. Thus, I felt it would be a perfect case for regional anesthesia–in this situation, use of the mental nerve block. The technique is demonstrated in the video below. After cleaning and irrigation, I planned my repair strategy. 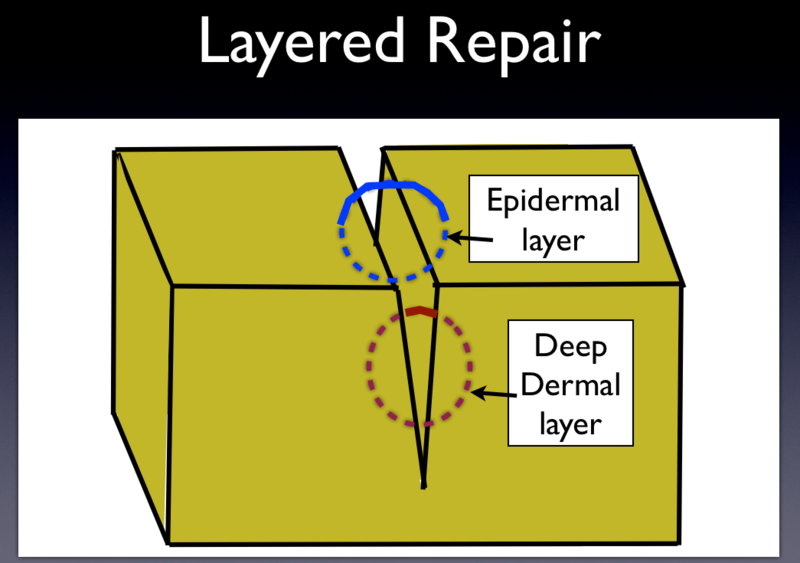 “Layered” repair typically refers to the use of absorbable sutures to bring together the dermis and underlying subcutaneous tissue, which both closes dead space (where otherwise infection/abscess may accumulate) and relieves tension on the epidermis. After this, surface closure of the epidermis is performed with less tension, and thus better cosmesis. Cartoon depiction of layered closure. The red suture is a simple interrupted deep dermal suture, placed underneath the skin surface to relieve tension and close dead space. The blue suture is a simple interrupted epidermal suture, which approximates the skin surface and will require later removal. The situation is even more complex when considering the through-and-through intra-oral laceration. In this case, a “three-layer” closure is needed: first, the underlying dermis and subcutaneous tissues must be approximated; then, the epidermis is closed; finally, the intra-oral mucosal layer is closed. The video below demonstrates suture placement in each part of this patient’s repair. The “under-layer”–approximation of the dermis and subcutaneous tissue–is certainly the toughest, as it can be hard to determine how the tissue is meant to come together. It pays to take a moment to do some planning and determine how the tissues will best properly align. The obicularis oris muscle tissue, like any muscle tissue, doesn’t hold sutures well. So, you want to do your best to drive the suture material through the dermal layer on each side of the wound just below the epidermis and the intra-oal mucosa, respectively, for better anchoring. I used vicryl suture material in this case, an absorbable suture that provides a longer duration of effective wound support given its slower hydrolysis. The second layer is the epidermal closure, which in many ways is the most important. This is the part of the closure that matters the most to the patient as affects the cosmetic outcome. The tension should be minimal after placement of a deep dermal layer to close the underlying tissue. This layer can be closed with simple interrupted 6-0 nylon sutures (which will need to be removed in 5-7 days), or even fast-absorbing plain gut sutures (which won’t need to be removed later). The final layer is closure of the mucosal side. For this type of laceration, I’d advise closing the mucosa with a few simple interrupted plain gut or chromic gut sutures, which will hydrolyze and dissolve in a moist environment. It’s worth noting that many partial thickness intra-oral lacerations really don’t benefit from suturing at all. If they are naturally well opposed, healing is likely to occur without any noticeable problems for the patient. However, in the case of the full-thickness, through-and-through laceration, I would strongly consider closure to prevent food or particulate matter from lodging in the gap. A photograph of the laceration’s appearance at 6 months. 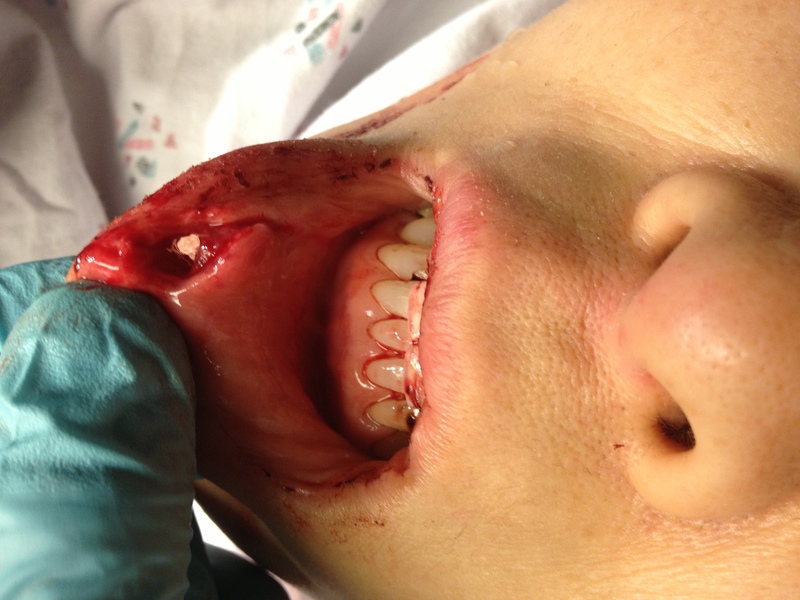 Photograph of the laceration from the inside of the mouth, at 6 months. 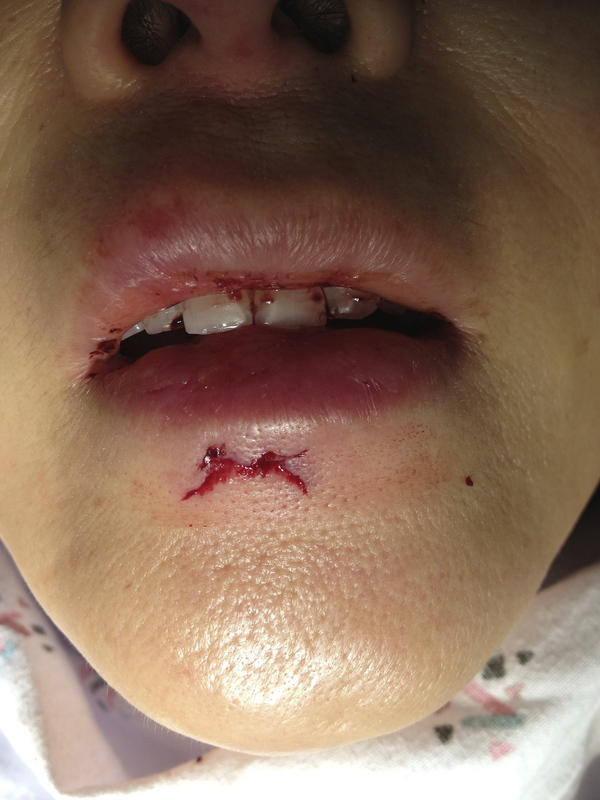 Repair of intra-oral lacerations is a complex topic with multiple considerations. For further reading on current techniques and practice recommendations, check out this review on Lip and perioral trauma.